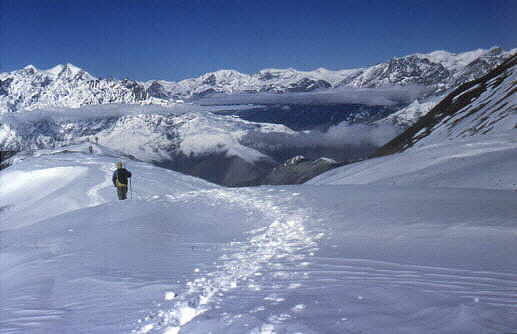 For most of the people crossing Thorong la will be the first time, that they go above 5000m. Therefore its very important to know a few things about altitude maountain sickness. I have myself met aquiet a few people, who had very serious problems up there and its a fact that still people die because of altitude sickness. The exact reasons are not completely known, but a few things can help you greatly to enjoy a safe an nice journey. Have in mind, that perfect physical and mental strenght dont protect you from altitude sicknes, wich is due to an unbalance of physiological processes on the level of your cell membranes. It is often the sporty, strong an fit people who will react to late when the first symptoms occur. Your even never know from previous trekkings, how your body will behave this time. Your body need time to adapt to the lower pressure and content of oxygene. From my personal experience I know, that every day I spend on acclimatizatin days, helps greatly to enjoy more the days at hight altitude. Ifyou have the possibility, try to spent some days above 3500m before going over Thorong la. One should not sleep more than 400-500m higher than the night before. It helps your body a lot, when you could climb higher in daytime than the level of your sleeping place at night. When you have light symtoms, like headache slow down or go even back and down again and wait till your feel better. That you wake up in the middle of the night, your heart beating at 120 and your are gasping for air, is just a normal sign of acclimtization. As soon that your have serious problems, like very strong headache, problems holding your balance, view or sightproblems, vomiting you should go down imidiatly. There is no sense in hoping that I will improve or that a helicopter will fly you out. If you can not walk anymore on you own feets, find people who carry you down, even the little kitchen boy will do so, if you pay him enaugh. Ask other trekkers or their porters. Going down at least 400m or to the last place without any symptoms is the only safe thing to do and holidy in nepal is just not the right place to die! This does not mean, that you have to stop your trek, you might try again one ore two days later. 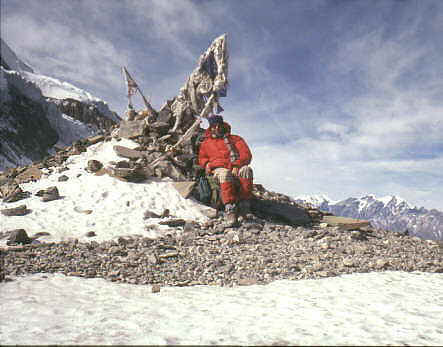 Ther was a climber, who felt sick at everest base camp and had to be carried down who could succesfully climb everest later! There a very good section on altitude sickness in Lonely planet´s “ Trekking in the Nepal Himalaya” or the guidebook “Round Annapurna”. There is also a very good and smal book “The hight Altitude Medicine Handbook” by Pollard and Murdoch, wich you can buy for little money at pilgrims book store in Kathmandu/Thamel. Dexamethasone, wich is an emergency drug but wich can improve dramaticaly your health when you have serious problems af acute mountainsicknes (specially with HACE). I gave it twice to people who could not walk anymore by themself, and both recovered within half a hour and could go down on their own. Just be aware, that this drug is not curring you, its only helps you temporaly to be able to go down as fast as possible to a lower altitude. Seen the ridiculous price wich is about a cup of tea, everyone going to high altitude should buy a strip of it in Kathmandu. Above 3000m you will see Yaks. These peacefull animals dont stay below 3000m as there the air is far to thik to breathe. Pure yaks dont give much milk, so that they are often interbreeded with cows. 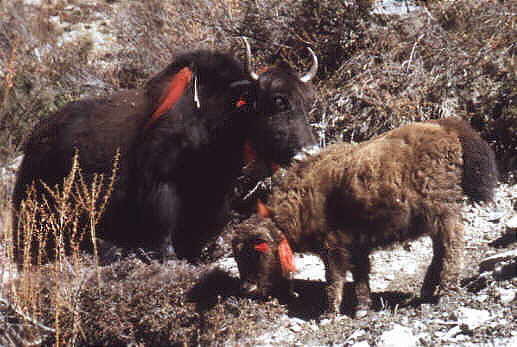 Yaks have long hairy haremspants and a typical ”horsetail”. Female yaks are called Nak, so that yak cheese is pretty silly, isn´t it. 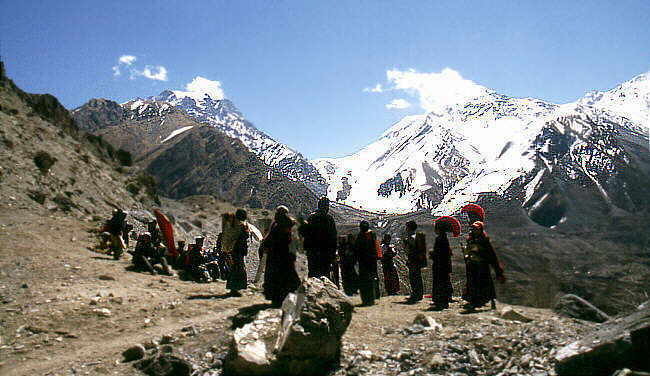 Thorong Phedi is situated at the end of the valley at 4400m. during the day ist nice warm in the sun, but in the night in can be really cold. In the early morning, one has to climg up the very step trail above Thorong Phedi. On the right side you see Yakawa Kang. It does not make to mauch sense to start very early in the morning, E.G, at 2 am. Climbing up these 300m to Thorong Phedi high camp, you will gasp with little result for air, its already very thin. During most of the year, there is little snow on Thorong La, But be prepared at every season to have lot of it, this picture was taken around 25th of october. 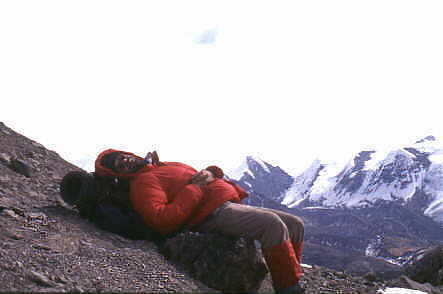 In other years on3e could cross Thorong la with shorts at this time! When there are good weather conditionthe trail is very easy and has no technical problems. Many times one will think, that he already can see the pass butits only the 14th time that the real pass with the prayer flags will apear. Tibeten and nepali people put a stone on the pile with teh flag pole and say “la so so..” For the gods beeing greatfull the gods permitted them to cross the pass. What a differece to us Westerner proudly proclaiming ”I did Thoron La!!! !